The safe integration of renewable energy remains one of the great challenges facing the operation of the electricity system. This integration poses great challenges and a high degree of complexity in the Spanish electricity system, due, among other unique characteristics, to the limited capacity of interconnection with the rest of continental Europe and the shape of the demand curve on the Spanish peninsula. The commissioning of the new interconnection with France has increased the existing interconnection capacity between the two countries. Strengthening interconnections can allow the mitigation of the required limitations associated to scenarios where there is a high level of energy production from renewable sources by facilitating the export of electricity to other electricity systems. However, even with the new interconnection, our interconnection capacity with France remains well below the guidelines given by the European Union (interconnection level of at least 10% of installed capacity by 2020). On the other hand, the peninsular demand curve varies depending on the time of year, day of week, temperature, etc., but the aspect that stands out the most is the difference in consumption during peak and off-peak hours. As a consequence, the manageable power production units must operate in a more demanding regime and with greater flexibility due to the fact that they are the principle units responsible for keeping up with the demand load curve throughout the day. This requirement has increased even more in recent years due to the increased quota of renewable energy capacity installed in the system and the priority regarding its operation over other technologies. Variability in renewable generation and difficult to predict. Contribution of renewable generation to the system’s ancillary services. Red Eléctrica’s focused efforts to integrate renewables is made evident every day through the effective functioning of the Control Centre of Renewable Energies (Cecre); the technological tool through which we are addressing the challenge of incorporating into the electricity system energies that are highly variable, much more difficult to predict and have less capacity to adapt to demand, due to their dependence on climatic conditions. 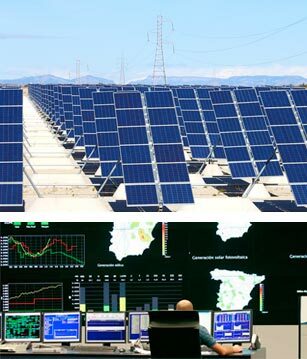 The operation of this control centre, a world reference in the integration of renewables, provides a high response capacity to identify risks and anticipate the behaviour of these intermittent energies and offset their high variability, without compromising the quality and security of supply. The work of the Cecre has made it possible for renewable energy generation to have represented nearly 40% of the annual energy production in the Spanish peninsular electricity system in recent years, reaching in some cases hourly coverage values greater than 80%. This is allowing local energy sources to have an increasingly prominent role in the coverage of demand, thereby reducing our dependence on foreign energy.